During the Middle Merethic Era, Aldmeri explorers mapped the coasts of Vvardenfel, building the First Era High Elven wizard towers at Ald Redaynia, Bal Fell, Tel Aruhn, and Tel Mora in Morrowind. [...] the Dwemer were the remnants of the early Aldmer who had settled the coasts, and developed a highly sophisticated and technological culture. Needless to say, though, Velothi towers look Velothi in style, so it is more likely that -- if anything -- they were (sometimes) built on top of those really ancient towers/settlements. Whatever they are, Velothi towers do not appear to have been built for defense, nor do they appear to have served as full-on settlements. Purpose: typically inhabited by upstart Telvanni mages. Distribution: 12 towers spread over all but southwestern Vvardenfell and Red Mountain Region. They tend to be clumped together somewhat. I am not counting Ghostgate and the Telvanni Tower in Vivec as Velothi towers. Layout: Shishara provides a good example of a typical layout for a smaller tower. The exterior typically consists of three statics: a doorway, a door and a tower. The tower is typically disconnected from the entrance in the exterior. The entrance opens into a small 3x2 room with two pillars. A door on the opposite wall leads to a hallway which is often but by no means always very short and connects the entranceway with the tower itself. in_velothismall_hall_01 pieces are very common, and larger interiors tend to have curving hallways with some branching paths and several side rooms. The tower itself is at the other end of the interior and is typically two storeys high. The lower storey is often fairly empty -- just one big room -- while the upper storey is generally where the resident mage sleeps. In larger interiors bedrooms and jails are fairly common. Roughly half of the towers have two-storey summoning rooms that do not have domes. Hanud, Odirniran and Vas are notable for having two interior cells each, as opposed to the typical single cell. The second cells of Hanud and Odirniran, as well as -- to a slightly lesser extent -- the interior of Shara have extremely similar layouts. Ald Redaynia is a clear exception both in regards to its interior and exterior. Intriguingly, it was supposed to be a settlement earlier in Morrowind's development. Sulipund lacks the entrance room. Purpose: roughly half of the Velothi towers in TR_Mainland are inhabited by Telvanni. The rest either have a Temple association or are inhabited by some other form of squatter. There are also a lot of interiors I would not categorize as Velothi towers, in the vein of Ghostgate. 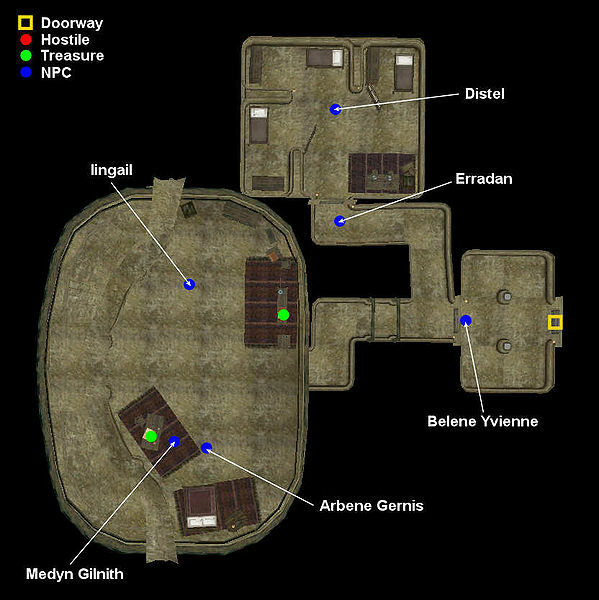 These include ancestral tombs, Temple locations and places like the Telvanni Library. (Putting a reminder in here for myself of Tiriramannu and its 'Blessed Stone'). Distribution: I would only call 6 interiors in the TR_Mainland file Velothi towers. In general, they are very sparsely spread out. Layout: going off of the TR_Mainland file, not one interior has the standard entranceway, though Ohishiran comes very close. Ohishiran's exterior is nothing like a typical Velothi tower, though. I feel the interiors often have very western-style trappings for some reason; a row of kegstands in Vys-Assanud, the bottom half of the Tel Sadas tower is essentially a feasting hall, there's a winerack in another interior, the way the Telvanni Library was handled... The modders who made these towers love partitions, planters, and long, empty hallways, and often apparently wished they were making ancestral tombs instead. And so included a tomb section. Most Velothi towers have a very simple layout: a bunch of rooms connected to hallways, or often one occasionally branching hallway. They are often very linear. They are also often very empty, and I'm not just talking about the hallways. All of the above characteristics apply to vanilla as well as our towers, and I only consider the last to be a bad thing. I think a lot of our towers require more work, and that they would mostly not be hard interiors to work on. I think it would be worthwhile and achievable to stick to vanilla convention in this case, adjusting our interiors accordingly. Currently, they're a bit of a mess. This would mostly involve adding and removing hallway pieces to move the rooms about, improving the detailing, and splitting off parts of the interiors to turn into new interiors. (Extra domes can become new Velothi towers, the tomb areas can form the core of new ancestral tombs). The exterior adjustments would be even easier to make. The important thing we need to figure out -- which is probably the reason our Velothi towers are currently all over the place -- is what their purpose should be. As established in the Skype Meeting of March 22 (the very last note), the proto-Telvanni explanation is pretty good as far as origins are concerned. Ideally, this would be hinted at even in interiors not currently used by Telvanni; there might be repurposed summoning rooms, repurposed prisons, (which I assume is where the proto-Telvanni stuck any unwanted visitors, as Telvanni still like to do), etc. As abandoned structures, a certain amount of variation in modern use is to be expected. As far as distribution is concerned, I'd say that the only real pattern would be that they would tend to be secluded; located away from traditional population centers, generally in hilly or mountainous terrain. In Morrowind, the Telvanni inhabiting Velothi towers have not been doing so since ancient times. The towers were unused for a long time, and only with House Telvanni's recent expansionist policies have upstart Telvanni made their homes there. As such, even in Telvannis, I think it should be rare for a Telvanni to inhabit a tower, except perhaps along the House border. However, I do think unaffiliated wizards could perhaps inhabit a few towers, but these should be relatively rare. And in Telvannis, some young Telvanni who refuse to stay in the shadows of their masters could have set up shop in some towers as well. They need not necessarily be aggressive, though their summoned guards would be. Unless there's a really good concept, I do not think the towers should be shrines, or otherwise holy places. These are pre-Tribunal structures, and their inhabitants probably wouldn't have been the sort to do saintly things anyway. Nor should they contain tombs. I'm also currently leaning in the direction of not wanting them to be home to bandits or vampires unless -- again -- there is a good concept for it, as such uses strike me as boring. An idea I do like is for many of them to be inhabited by lone Temple theologians, and others to act as sorts of schools that teach novitiate priests and sometimes even Indoril Temple theology and -- especially in Indoril lands -- the laws determined and the laws ordained. In general, counter to their being labelled as a dungeon type, I think I generally prefer ideas for peaceful use; perhaps in Redoran lands one could have been repurposed as a roadside inn. Perhaps some could be used by dissident priests and other underground or otherwise undesirable or secretive groups or tongs. One potentially hostile purpose I'd like to see at least once is for Daedric cultists, similar to those found in your standard Daedric ruin, to have occupied a tower to make use of its summoning room. A tower could also be occupied by a western necromancer further west, who may or may not attack on sight.